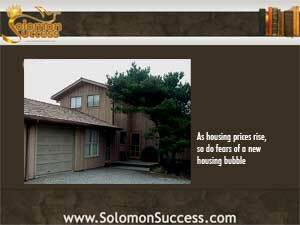 Solomon Success > Blog > Do Rising Home Prices Mean Trouble? Although King Solomon spoke frequently of the wisdom for which he’s best known, the wise king also had much to say about wealth, prosperity and the prudent management of money and other assets – observations that are equally relevant today. In Proverbs 13: 11, the monarch says, “Substance got in haste shall be diminished, but that which is gathered little by little with the hand shall increase.” As housing prices soar in many markets, housing industry experts worry about the possibility of another housing bubble of the kind that led to the 2008 collapse – a hasty acquisition of substance that could diminish quite rapidly if the same conditions prevail. Historically, housing prices tend to rise a relatively modest three to four percent per year. But in the years leading up to the crisis of 2008, prices were rising much higher – and faster – than that in most major markets. In 2002, over 5 years before the crisis, hosing prices rose around seven percent. Those increases led the way for what was to follow – eight percent in 2004, and by 2005, 12 percent – about three times the historic average. And rise, and rise. In Phoenix, for example, housing prices are up 25 percent over last year. Though prices are still lower than they were at the peak of the bubble, the selling prices of homes in most major markets have surged upward in the past year or so. The rise in prices relates in some markets to foreclosures, which are still coming on the market as actions initiated during and after the collapse are still being processed. In other areas, foreclosures make up only a fraction of the homes being sold. In some ways, this rapid rise in housing prices is due to large investors and investment groups that are buying up quantities of available properties for rentals. But, some experts fear, these investors may be tempted to take advantage of the rise in prices and flip those homes before a downturn – or worse, a crash. If that happens, there may not be enough qualified homebuyers –either residential buyers or individual investors following Jason Hartman’s investing guidelines – to keep these properties moving.